On Tuesday I shared some ideas from Cherry Hill's Horsekeeping Almanac for controlling mosquitoes around your property this summer. But as we all know, it’s impossible to eliminate them entirely. 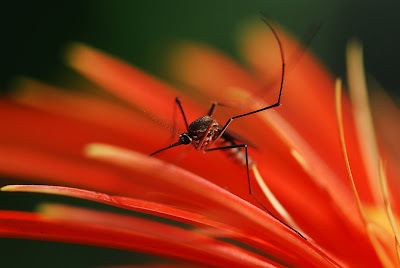 According to TinyMosquito.com, hundreds of thousands of mosquitoes (which means, fittingly, “biting fly”) are born every day, and these diminutive carnivores are responsible for more human deaths than any other living creature. Yikes! So how do we protect ourselves from both the discomfort and danger of mosquito bites? Well, if your first line of defense includes spritzing yourself with a commercial repellent, Stephanie Tourles, author of Organic Body Care Recipes, suggests you “read some of the precautionary statements — in tiny print — on the labels of popular, commercially available chemical-based mosquito repellent sprays. Perhaps you’ll think twice in the next bug season before using this type of product on your skin and seek natural, nontoxic alternatives and cover up with clothing and hats when necessary." While you're on your own with the clothing and hats, natural, nontoxic alternatives happen to be Stephanie's specialty. In addition to recipes for bath blends, body powders, shampoos, conditioners, and massage oils you can make yourself, Organic Body Care Recipes includes instructions for several varieties of insect repellents. Below we're sharing one that promises to not only repel mosquitos but moisturize and perfume your skin with a blend of natural soybean and fresh essential oils. I make sure to use this oil every day when bugs are at their worst — and sometimes twice per day to achieve the effect of literally saturating my pores with its bug-repellent properties. As a bonus, my skin is very soft and conditioned — and occasionally I even get a compliment on my unusual fresh “perfume.” If they only knew! Add all ingredients directly to a storage container. Shake the mixture vigorously to blend. Allow the oil to synergize for 1 hour. No refrigeration is required, but for maximum bug-repelling freshness and potency, please use within 6 to 12 months. Application tips: I like to apply this formula onto my palms first, then massage the oil into areas that need bug protection. During the height of bug season, when the little biters are on their worst behavior, I actually use this pleasantly fragranced, oil-based repellent as an after-shower massage oil, bath oil, hair conditioner, scalp massage oil, and all-purpose body-moisturizing oil. Great formula, I bet is smells lovely! Another good mosquito repellent essential oil is Lemon Eucalyptus (Eucalyptus citriodora). Melanie, great recipe, thank you for posting it. As a pharmacist I find it a bit troublesome that there is a lack of natural insect repellents. Yes, I understand the need for DEET for some, but we are not going into a west Nile virus infected mosquito tank either. I am the mother who does not want her child nibbled on in her sleep...why would I smother her in DEET after a warm bath? This potion you share she would love and we are almost completely out of the one hard to find natural repellent we had. Never thought to make our own. We could turn into a quick science project as we mix it up! Karen, exactly, more fun to make it a family project!